The DRJ Products, Dr. J Pure Organics and Dr. J Skin Clinic are some of the most pure and effective products you may use. 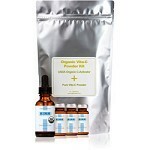 The Pure Organic line is all pure and so good for your skin. The Rejuvenating Serum and Eye Repair Serum are 2 of my favorite products. They are anti-aging and very firming. 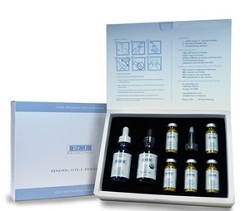 Dr. J Skin Clinic products are also pure but they are medical grade also. They have a few more ingredients to bring results to the skin. They are used by many physicians for their in office treatments. They have some of the best Vitamin C products on the market. They are high quality and not watered down with all kinds of filler ingredients. It is only the best for DRJ. The Vitamin C Kit pictured above is 99% Pure. Perfect for anti-aging and pigmentation. Here are 2 wonderful products by Dr. J Skin Clinic. I call them the Pigmentation Duo. You have Vita C Peel, which gets rid of the debris and exfoliates the skin. The the potent Vita C 20% Serum which is an anti-aging product. It will help even out your skin tone. Products should be used in the evening. Just add a few drops of each and apply them to your skin. Dr. J Skin Clinic products are natural. Healthy ingredients for your skin. They are used by physicians around the world. They are medical grade products. They are gentle on your skin because of the high quality ingredients. I love this product. Dr. J Vita C Powder Kit. It is made for professionals. That is why it looks more medical. You receive 3 small bottles of 99.8% Pure Vitamin C Powder and a bottle of activator. It works well to reduce wrinkles, and pigmentation. You may either mix the activator with each bottle, which will then last for a week or so. What I do, is put a small amount of Vita C Powder in the palm of my hand. I add a little activator and mix. Once it is dissolved, apply it to your face. this way you will receive many more usages of the product. It will be active each time you mix it. For more enhanced results, use the Dr. J Skin Clinic Vita C 20% and Vita C Peel. Very natural and excellent results.